I like to get my photos out there as quickly as possible. In fact, I try to be done with processing my photos within a day of returning from a trip. 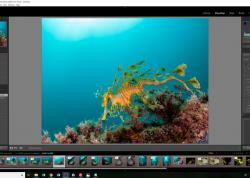 Not everyone wants to sort through thousands of photos after a trip and spend hours editing them, so I've developed a system that everyone can use to make the process as easy as possible. 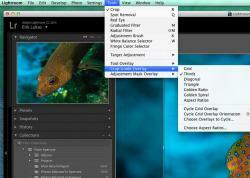 I am using Adobe Lightroom 5, but these tips can be used with any of the recent versions. 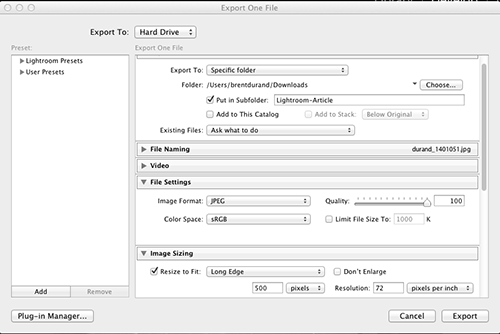 This way you can save a RAW file to edit, but immediately post the jpg online. 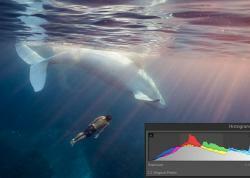 Many new cameras have wifi so that you can post to Facebook as soon as you surface. I like to quickly view a slideshow of my JPEG files, and then make a list of my favorite photos on a piece of paper or a notepad to keep track of the best ones. Although many photographers import all of their RAW files into lightroom, comparing them and deleting them, I find it faster to just import your best ones. 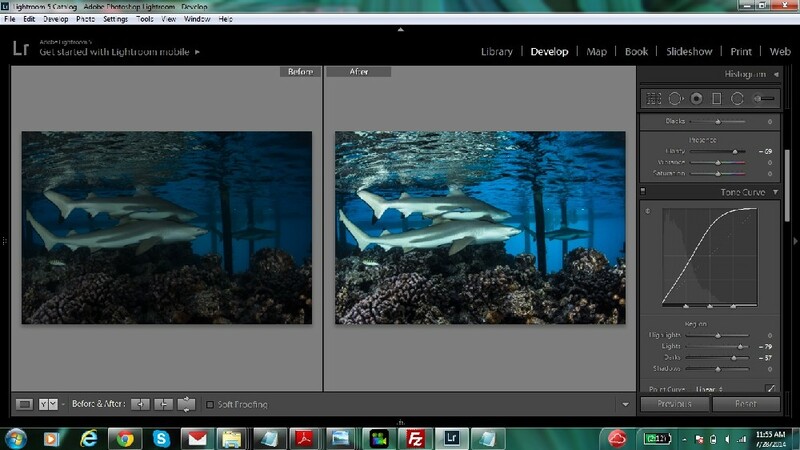 Put these best photos in their own directory so that they're very easy to find and import once you open Lightroom. 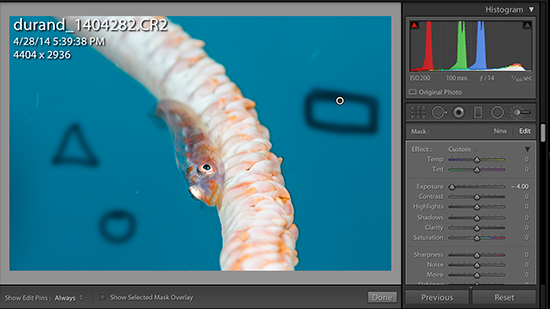 Once Lightroom is open, simply click File and then Import and select the directory where you saved the 20 (or more, or less) of your best photos. 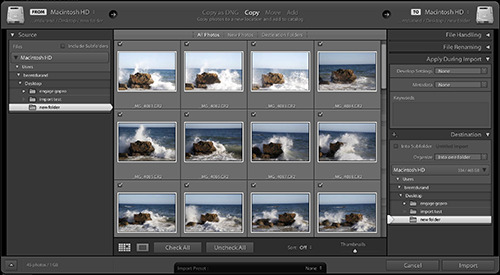 Click on the Develop module to begin editing your photos. I spend a minute or two editing each photo. Cropping is quick and easy in Lightroom's Develop module. Each photo should be cropped if needed to achieve the optimal composition. 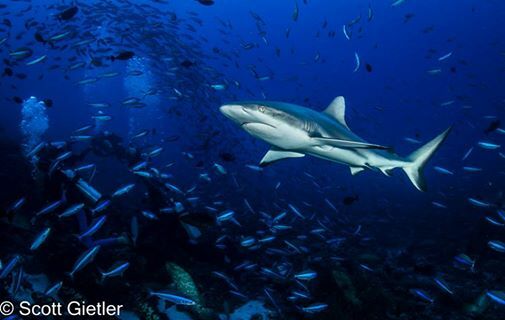 Underwater photos often can use a contrast boost, which can be achieved by adjusting the sliders for contrast, clarity, blacks, highlights and shadows. If you have backscatter or other elements in your photo by accident, you can remove them with the healing tool. The healing tool can also remove distracting elements from the photo. The adjustment brush can also be used to paint an area to make changes. In the screenshot below I've reduced the exposure by 4 stops and drawn different shapes to show how you have full freedom to paint in areas needing to be adjusted. 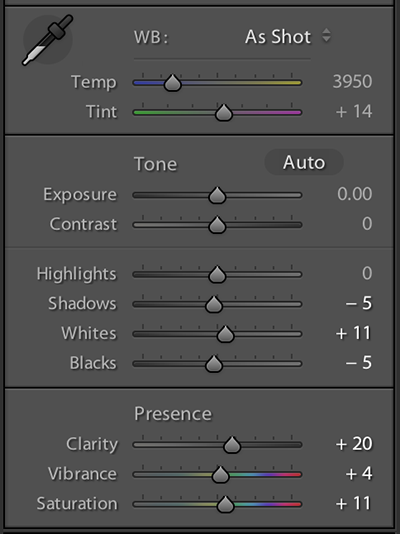 Lightroom allows you to rate your images to help find your favorites later on. 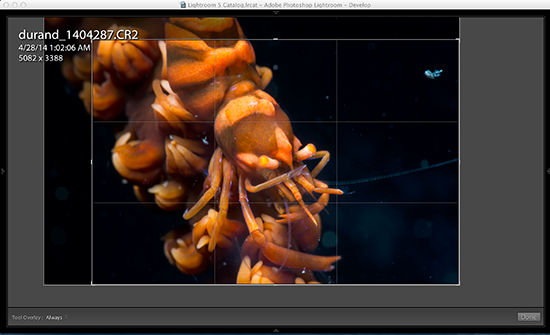 Once done editing, it's time to export our photos as .jpg files. I like to save them in the same directory the RAW files are. Make sure to set your photo dimensions for the size you will want to share. I usually export them at 2000 pixels wide for slideshows, or 1024 for facebook uploads or web sharing. If you're putting photos online, you may want to include a watermark. You can add the copyright symbol by holding down the alt key and typing 0169. 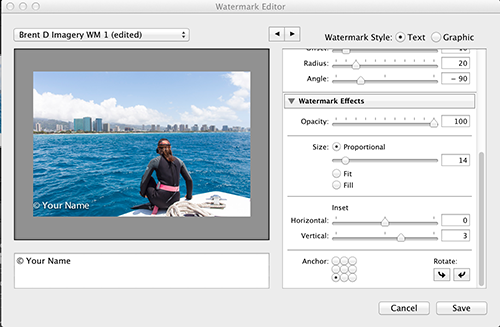 Once your photos are exported with watermarks it's time to share! Time to let your friends know what you saw underwater. Facebook, smugmug.com, instagram and flickr are popular places for people to share their photos with others. 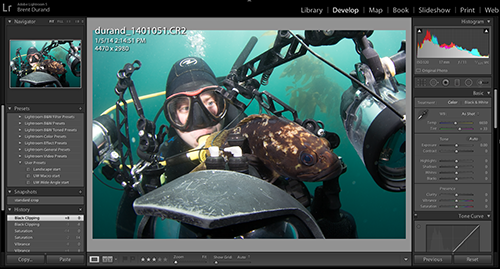 Contact Scott Gietler by emailing scott@bluewaterphotostore.com for info on taking a lightroom class, either remotely, on a dive trip, or at Bluewater Photo in sunny Los Angeles, California.